Welcome to our new challenge at Aurora Wings. This will be our 3rd and our theme is all about “Butterflies.” How easy is that? Mitzi has some amazing images in her Etsy shop that would fit this theme. Why not use one of her amazing images and have double your chances of winning? 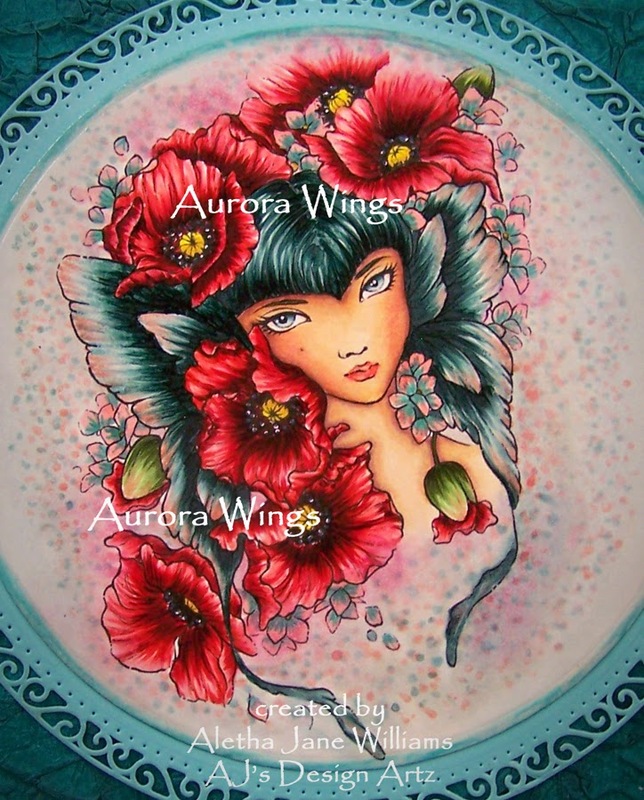 Aurora Wings challenges are anything goes with a theme. The other stipulation is that you must use a rubber stamp or digital image, and it must be colored. There are other guidelines that you can find on our Rules page. My mixed-media piece was a labor of love for me. 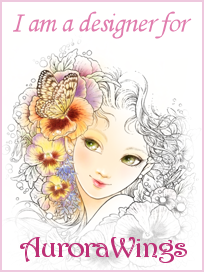 I think that I purchased Poppy Fairy/Butterfly Ears Elf digi when Creepy Glowbugg introduced me to Mitzi’s art. I say a labor of love, but I really did not feel like I labored at all. I love my Copics and I felt like this image deserved the best skills I could give it. I feel very satisfied with the outcome. I started this art work with an 8”x8” canvas board. I had some teal packing tissue paper that I kept, and I am glad that I did. I scrunched it several times. My next step was to use some DecoArt’s Decou-page on the canvas and smash down the scrunched tissue paper. I did not smooth it out or add a final sealer. I tried to keep as much texture as I could. I die cut the main image with one of the Spellbinder’s Grand Circle dies. I used some Peacock Feathers Distress Ink around the edge. When that was dry I added some Illuminate Smooch Ink to the embossed edge. My next Spellbinder’s die is the Grand Stately Circles with Stampin' Up! 's Cool Caribbean cardstock. This is an intricate die so I recommend using wax paper between the cardstock and die. For my final embellishment are my Frost Creek Farms metal corners. I hope you join us for our butterfly challenge. Do you need some more fun? 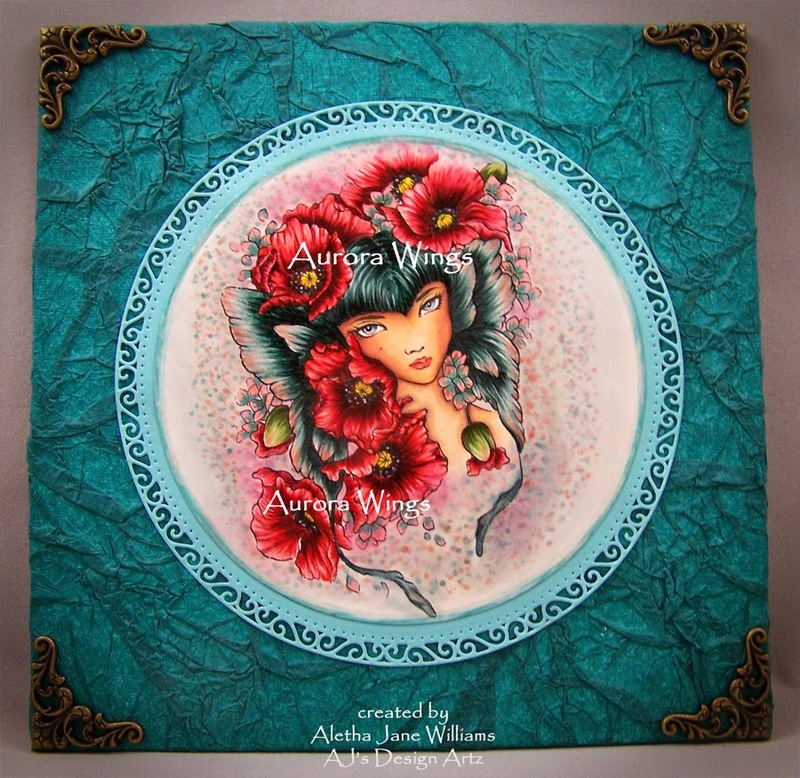 Hop on over to Aurora Wings Facebook Group and join for some creative inspiration. Mitzi has a Facebook contest this month and that theme is “shades of blue.” You must use an Aurora Wings image for this contest. I hope you have a wonderful and creative week. Thanks for stopping by. If you have any questions, please contact me. 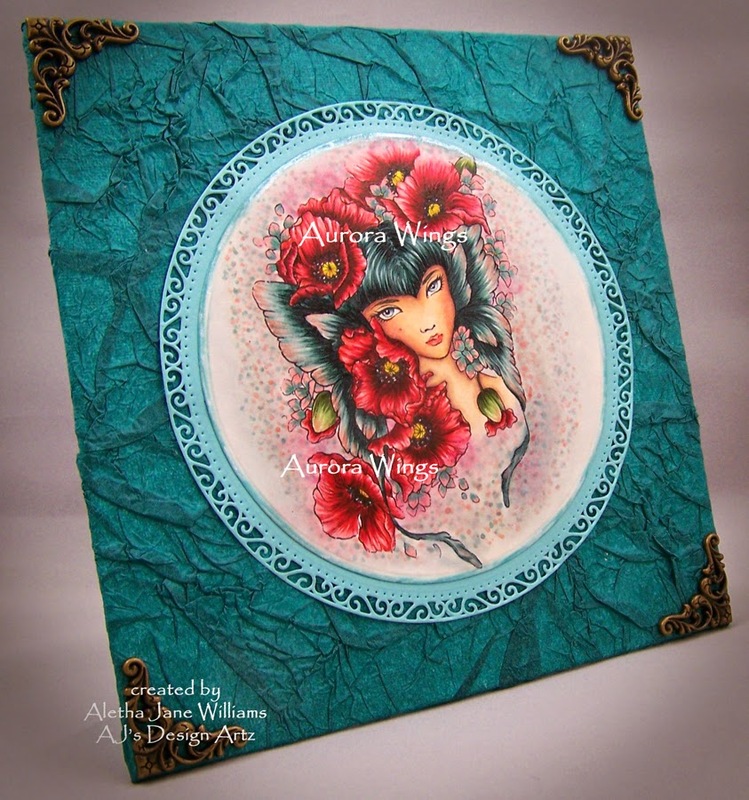 Stunning Aletha, love the rich colours and fabulous background you created. Absolutely stunning Aletha, I love your background which shows the image off to perfection. Gorgeous work! Your coloring is just beautiful. I love the colors you used. I forgot to mention thanks for playing along at Crafting When We Can this week!